Choosing the best dog food for your German Shepherd is crucial to keep your pet in thriving health. Since German Shepherds are a large, active, and energetic breed, they need a greater amount of nutritious, high-protein food. If your pet is still a puppy, you need to be extra careful about what you feed them in order to ensure proper bone and muscular growth. According to many pet parents, their dogs have remained fit and active on this high-protein dry dog food diet, and show glossy coats and good digestion. 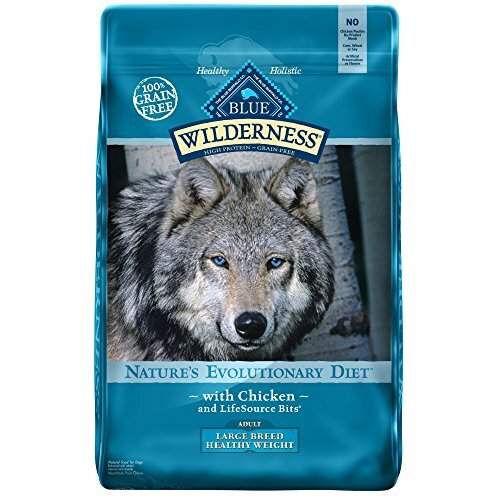 The main ingredients of the dog food include chicken, fish meal, peas, kelp, barley, blueberries, vitamins, and minerals. There are no poultry by-products, soy products or grains. There is perhaps no other dog breed in the world that is as instantly recognizable as the German Shepherd. These dogs have a long history of being widely used in the police force, the army, search and rescue teams, and as guard dogs, guide dogs, and family companions. Renowned for their intelligence, obedience, and confident demeanor, German Shepherds are loyal, affectionate, and protective toward their family and friends. They can, however, come across as intimidating toward strangers,or those they perceive as potential threats. In general, they will not hesitate to turn aggressive if they think that they or their family are being attacked. Given their large size, this can take an unfortunate turn if the dog is not properly trained and socialized. If you own a German Shepherd, you need to take the time to train and socialize your pet from an early age so that they are able to remain calm and controllable in different kinds of situations. German Shepherds were originally bred to be active, working dogs, so good health was paramount. The change of focus from working to show dogs, plus the popular demand for German Shepherds that led to poor breeding practices, has resulted in dogs with a genetic predisposition for a number of health problems. Many German Shepherds are vulnerable to bone and joint problems, skin problems, and neurological problems. If you are acquiring a new German Shepherd puppy, you need to ascertain that the parents have been tested for inherited health issues like hip and elbow dysplasia, degenerative myelopathy, eye disease, heart disease, autoimmune disease, and epilepsy. Feeding your German Shepherd a diet with the right amount of nutrients can help avoid or manage their health issues, and may help your dog lead a good quality of life well into their teens. German Shepherds need a high-protein diet, especially when they are growing. The healthiest food you can feed your dog is fresh or lightly-cooked home-made food. This can include meats like chicken, turkey, beef, venison, lamb, and fish, vegetables, fruits, and other foods like milk, curd, rice, and eggs. You can make up your own dog food recipes or look up the many dog food recipes that are available online. While cooking fresh dog food can take some time, it is really the best option to ensure long-term health for your pet. 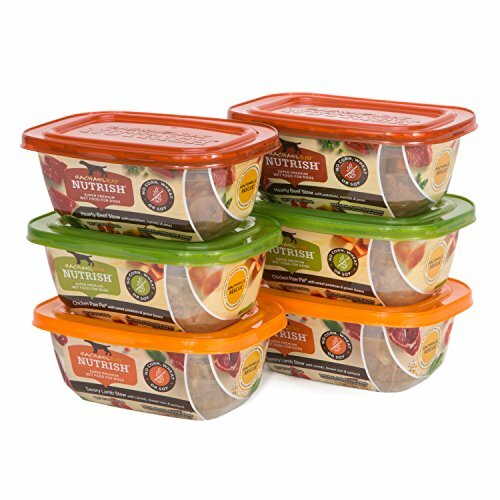 In case other commitments make cooking home-made dog food impossible, there are many dog food businesses that offer home deliveries of fresh cooked food. If this is not practicable either for you, there are various commercial brands of dog food for large breeds like the German Shepherd. You can buy dry, wet, and semi-moist dog food in a variety of ingredient combinations. Dry dog food is considered more nutritious as it contains the least amount of water content. Check the manufacturing date to ascertain that the food hasn’t expired, and be sure to read the ingredients list to ensure that there are no undesirable food items like animal by-products, junk fillers, food substitutes, and artificial preservatives, colors or flavors. Even if you decide to feed your German Shepherd commercial dog food, it’s ideal to include fresh food items several times a week to vary their diets. Like us, our pets enjoy a change in their regular food. It is also healthier to eat a variety of different foods. 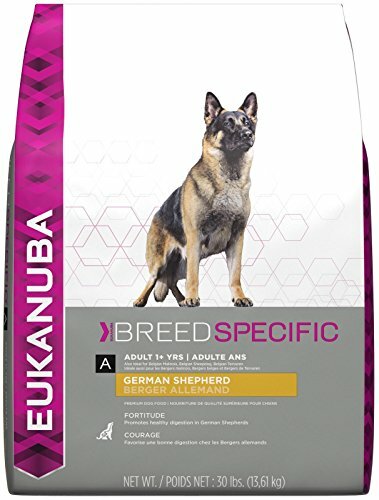 This high-protein food is formulated to provide your adult German Shepherd with the nutrients and fatty acids necessary to maintain strong muscles and a healthy skin and coat. It includes a 3D Dentadefense system that the manufacturer claims is good for preventing tartar build-up and keeping your dog’s teeth clean. The main ingredient is chicken. 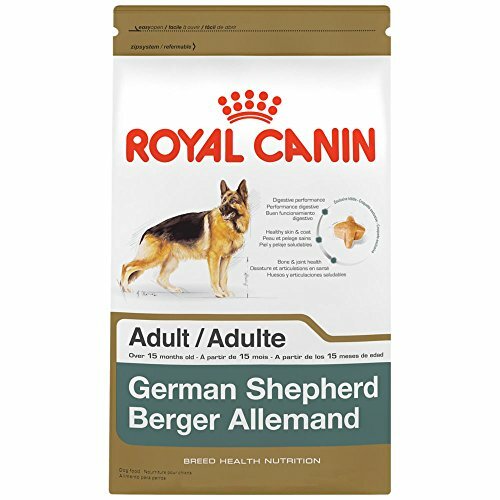 Royal Canin is a good choice if your German Shepherd is prone to allergies. 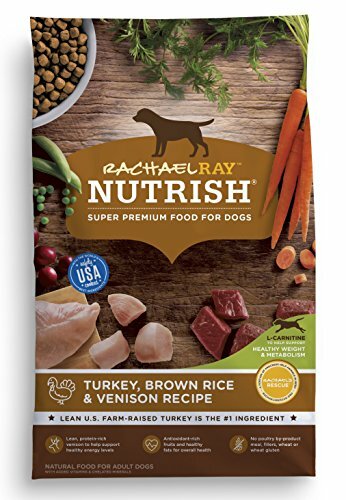 This nutrient-rich dry dog food is recommended for adult dogs with sensitive digestive systems and skin, and will be beneficial for their overall bone health as well. The main ingredients include brewers rice, oats, chicken, beet pulp, fish oil, vitamins, and minerals. 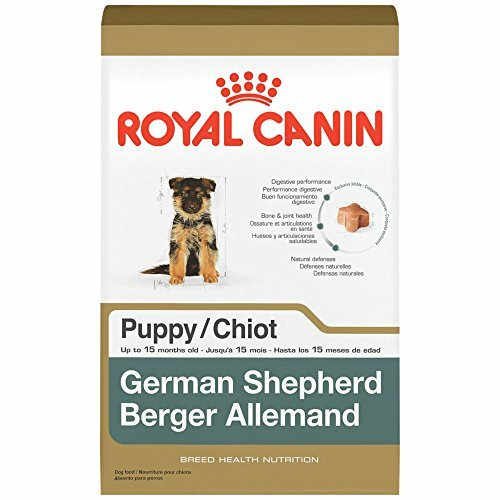 This dry dog food is formulated for German Shepherd puppies between the ages of 8 weeks to 15 months. According to the manufacturer, feeding Royal Canin to your puppy will promote proper bone growth and overall good health. Many pet parents have noted that a Royal Canin diet has helped resolve their pet’s digestive and skin issues. Be sure to check with your veterinarian and find out if you need to add additional supplements to your puppy’s diet. German Shepherds need a high-protein, nutrient-rich diet to remain alert and active, which this is what this dry dog food claims to provide. The main ingredients include chicken, turkey, potatoes, and apples, and there are no grains. Several pet parents have reported that their dogs like the taste of the kibble. Made with beef, chicken, lamb, beans, and carrots as some of the main ingredients, this nourishing stew will keep your German Shepherd active and fit. Some pet parents recommend mixing this wet food with dry food for larger servings, and dogs appear to love the salty taste of the broth. This dry dog food is a good choice for maintaining your German Shepherd’s high energy levels and keeping allergies at bay. Pet parents have reported that putting their dog on this dry food diet resolved the dog’s skin-related ailment in a matter of weeks. 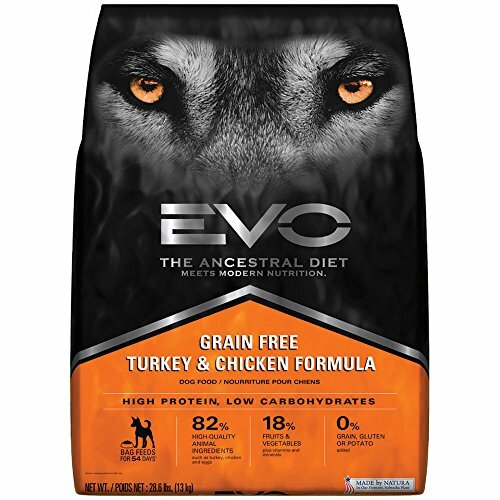 The main ingredients include venison, turkey, brown rice, beet pulp, carrots, peas, cranberries, olive oil, fish oil, vitamins, and minerals. The kibble is hard and crunchy. 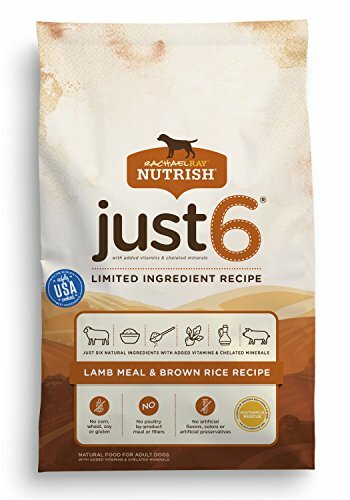 The two principal ingredients in this dry food are lamb and brown rice. There are no grains, soy products, poultry by-products, or artificial preservatives, colors, or flavors. Dogs with digestive problems have benefited from this diet. 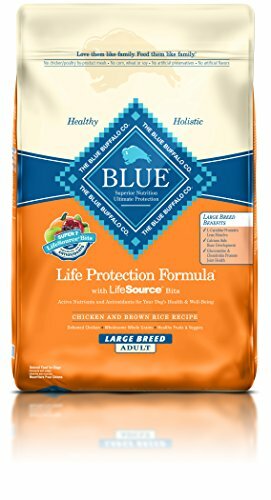 Deboned chicken, peas, tomato pomace, sweet potatoes, blueberries, carrots, garlic, and brown rice are the main ingredients in this dry food. The food is specially formulated to meet the nutritional requirements of large breed dogs. Some pet parents report that their dog’s skin allergies and digestive problems have either vanished or become more manageable after they put their dog on this diet. 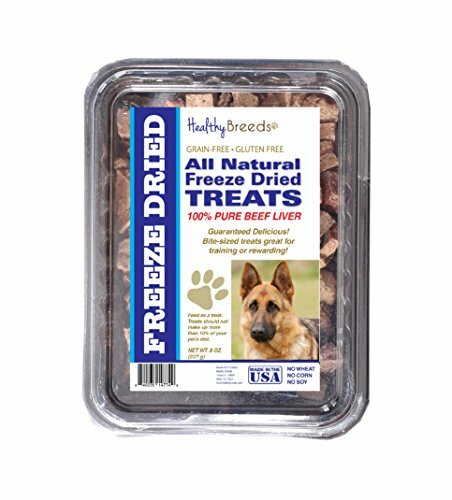 Looking for treats for your German Shepherd? Here are some made from freeze-dried beef and liver. According to the manufacturer, there are no artificial preservatives or additives in these treats, and they do not contain gluten or grain. Whether you decide to feed your German Shepherd home-cooked or commercial dog food, a diet that includes the right amount of protein and fat is a must to keep your German Shepherd in good health. For commercial brands of dog food, pick the best dog food for German Shepherds from the list given above and from your own market research. As mentioned earlier, be sure to check the expiry date and ingredient list. Cross out any dog food that contains artificial preservatives, fillers, animal by-products, and grain. For home-cooked dog food, pick the best fresh meat, fish, vegetables, fruits, eggs, milk, rice, and other ingredients you can get and cook lightly to preserve the nutrients. Get your German Shepherd accustomed to eating different types of food. This will be beneficial for them in the long run. Feeding your German Shepherd the healthiest diet possible can stave off allergies or help manage existing ones, and this will make it possible for your pet to live a long, active, and happy life in your company.